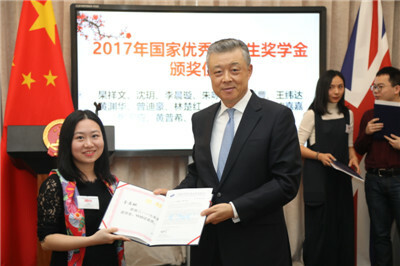 On April 19, 2018, Ambassador Liu Xiaoming attended the conferring ceremony of the Chinese Government Award for Outstanding Self-financed Students Abroad of 2017. 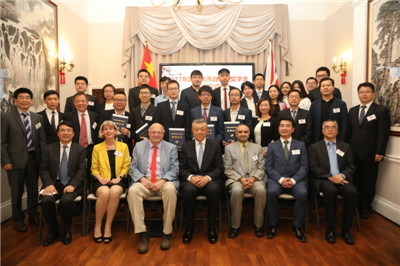 Presided over by Wang Yongli, Minister Counsellor for Education of the Chinese Embassy, the ceremony was attended by more than 60 people including awardees, their tutors, assessment experts and representatives of the relevant universities. At the ceremony, Ambassador Liu delivered a speech, extending his warmest congratulations to the 27 awardees. He said, "In a message to overseas Chinese students last December, President Xi said, 'When the young people are ambitious, capable and responsible, a country will have a future and a nation will have hope. To realize the Chinese Dream of national rejuvenation, we need successive generations of our young people to make tireless efforts.' With these words, President Xi entrusted the young people with a historic mission and showed them the way forward." In light of his understanding of President Xi's word, the Ambassador expressed his three hopes to the students, "First, I hope you will be the backbone of your country. The baton of patriotism is in your hands. Second, I hope you will be the pillar of your country. An important mission is here for you to accomplish. Third, I hope you will be a bridge for your country to build closer friendship and understanding with the world." 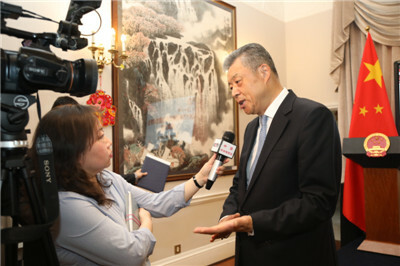 Ambassador Liu urged the students to seize the day and the hour to live their personal dreams by working for the Chinese Dream of national rejuvenation, to make their life worthwhile in building a community with a shared future for mankind, and to make great achievements worthy of their times and their youthful vigour. 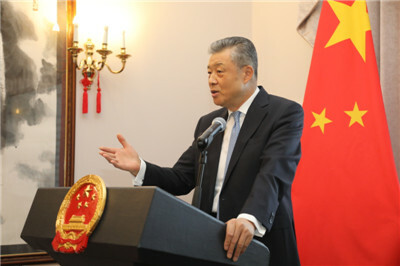 Ambassador Liu's speech won the warm applause from the participants. Li Chenxuan, a PhD student at the University of Exeter delivered a speech on behalf of the awardees. She said that the support and recognition of the motherland are the best encouragement and also the drive for them to continue to go forward and realize their dreams. They have the responsibility and confidence to take and pass on the mission and work for the Chinese Dream of national rejuvenation. On behalf of the tutors and the assessment experts, Professor Kai-Kit Wong of University College London and Professor Honghai Liu of Portsmouth University delivered speeches. They shared their experiences in tutoring Chinese PhD students, and their cooperation with Chinese research institutions. They hoped that China and the UK could further strengthen people-to-people exchanges and continue to expand exchanges and cooperation in education and scientific research. 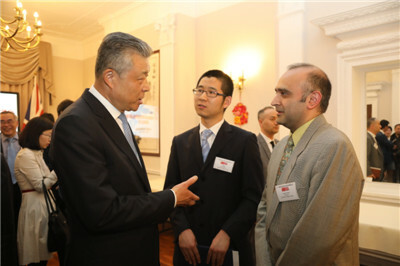 At the ceremony, Ambassador Liu presented certificates and awards to the awardees, and took photos with them, their tutors and the assessment experts. The Chinese Government Award for Outstanding Self-financed Students Abroad was set up by China Scholarship Council in 2003 to honor the outstanding self-financed overseas students and encourage them to work for their country. By 2017, 5,915 outstanding students have been given the Award, including 421 students studying in the UK, 2 of whom won the special outstanding award.